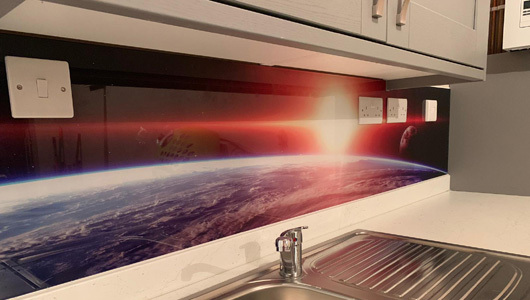 I am so pleased with my kitchen splashbacks. 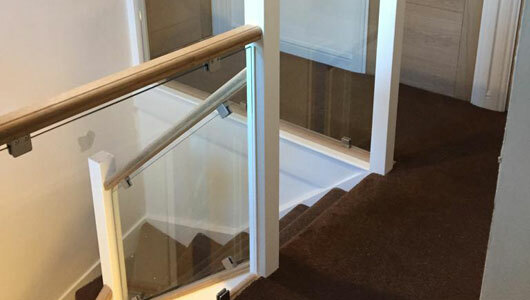 Your company has given excellent service from the initial quote to installation. 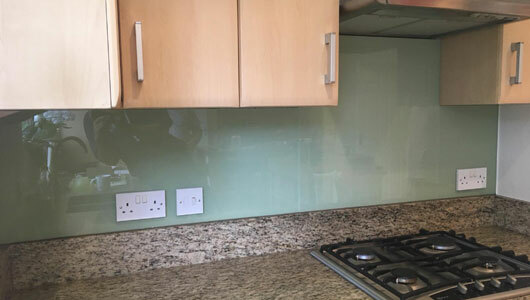 Mike, who came to template and was also the main fitter, was very polite and he did an excellent job of fitting the splashbacks. He took a lot of time to ensure a neat finish. He also cleaned up really well before he left. I didn't get the name of the other fitter, but he also did an excellent job, having to remove my sink and tap and scrape away some uneven plaster to get it in. I would definitely recommend this company. Outstanding customer service from initial email enquiry to installation. 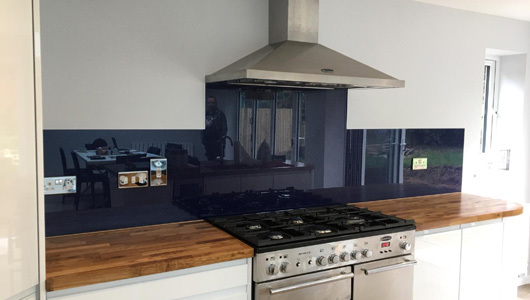 We love our mirrored splashback and the whole process has been so straightforward. Would highly recommend. 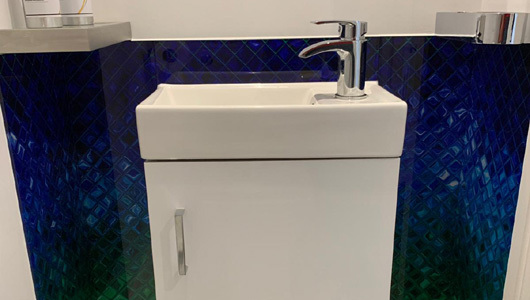 Second time we have had them do work for us, again it was a first class fitting, will be calling them again when we do our bathroom. First class service from start to finish. Everyone extremely helpful and skilled. 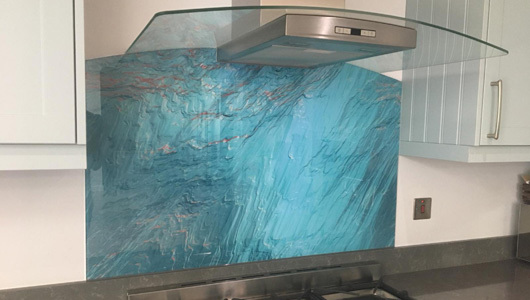 The splashback in our kitchen has add colour and sophistication and we are more than impressed with it. Definitely recommend them. Great service and communication. Templates and fitted by a really nice guy who did a brilliant job. 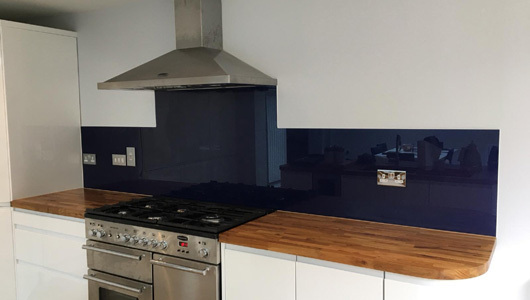 Splashbacks look amazing, very happy with them. Very pleased, quality is excellent. Installer was very professional and helpful. 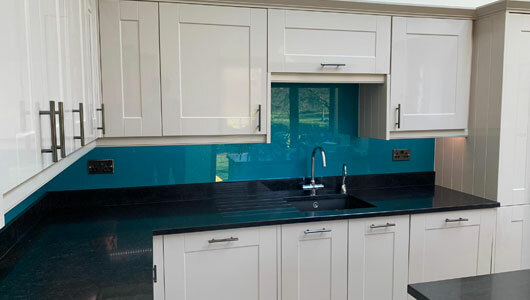 I am delighted with my splash backs and would highly recommend Splashbacks of Distinction. The service has been very good from the company from start to finish. 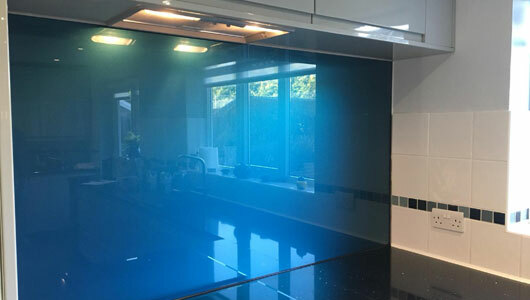 The glass completely finishes my kitchen project and looks wonderful. Very pleased with the product and fitting. Michael was very professional, polite and particular. Will recommend service. I received a brilliant service, Chad was most professional with returning emails and providing advice. All appointments and promises were kept and the final product looks superb. Both Chad and Mike were very helpful. 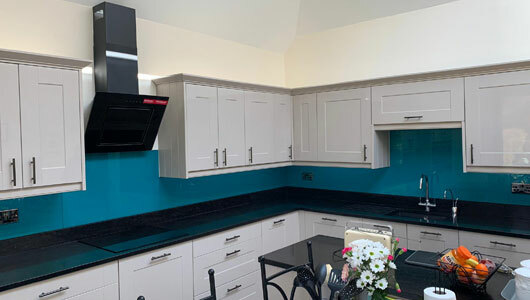 Really pleased with the finished result as all the new splashbacks look amazing and so many visitors have commented how fantastic they are. Mike does a great job and obviously takes great pride in his work, thanks! 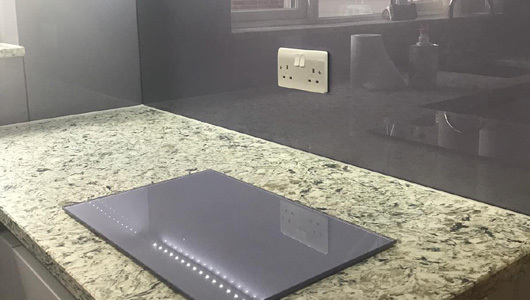 Really impressed with Chad and the team at Splashbacks of Distinction, we love our mirrored splashback! Thank you so much. Thanks for a great service. 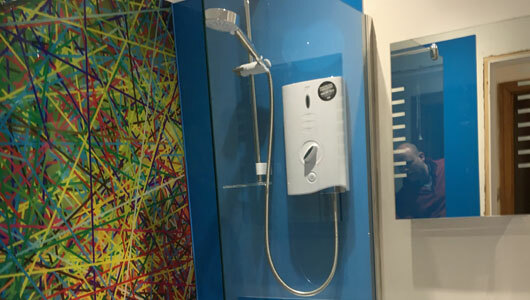 From support with colour choice and design, swift and helpful responses to our (many) questions and then a professional fitting of a high-quality product we're really delighted. No hesitation whatsoever in recommending to anyone: the top-end finish matches the service. Thank you again! The finishing touch to our new kitchen and we love it! Great service from the presales advice to fitting. Friendly,knowledgable staff. Happy to recommend as it was a super-efficient experience and high quality finished product. 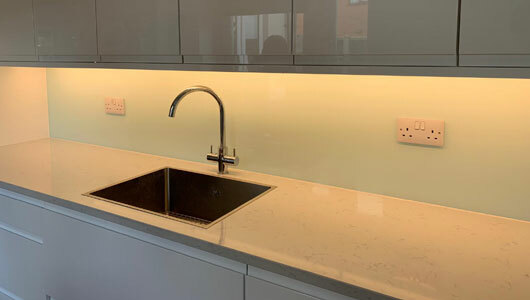 We recently purchased and had fitted a splash back to our kitchen. The service from sale to completion was excellent, Chad was most attentive to our requirements and Michael spent time going through the templating and explaining the process. 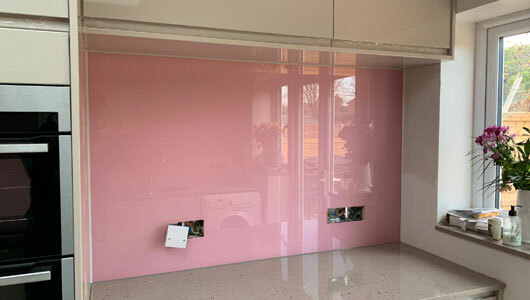 The product was delivered on time and fitted by Michael to an excellent standard. 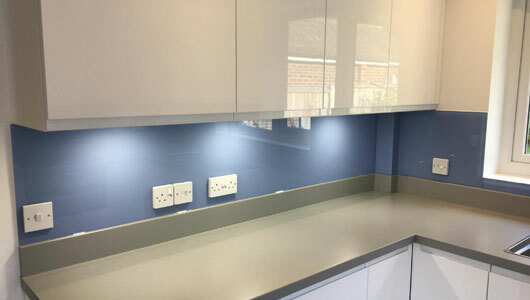 We're very pleased with the end result and would recommend Splashbacks of Distinction for any products. First class service. 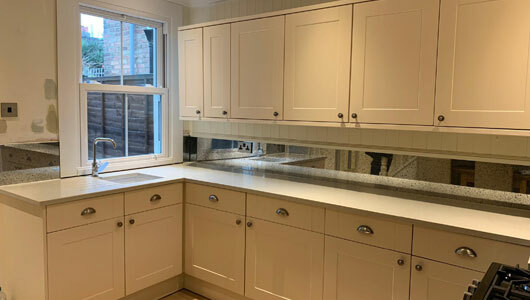 I have just finished my new kitchen with splasbacks from splashbacks if distinction and I'm so happy with the result. 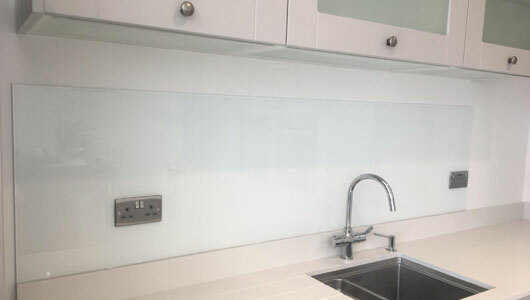 Having this glass option has given me the hygienic , easy to clean high quality finish I was looking for. 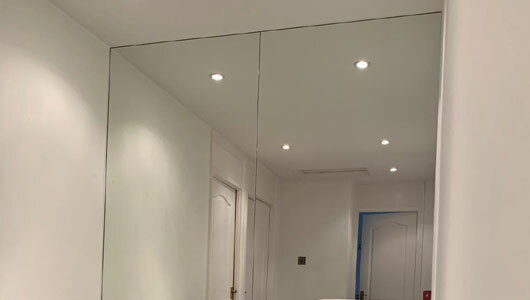 From start to finish the company have been easy to deal with and the installation team a joy to have in my home , covering every surface to make sure the rest of the house stayed clean. I would highly recommend this company and look forward to using them again. 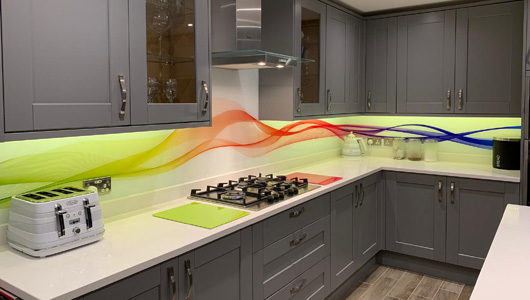 Splashbacks of Distinction completed my kitchen months ago with a stunning design and have now just completed my mum's also with a completely different but equally striking design. 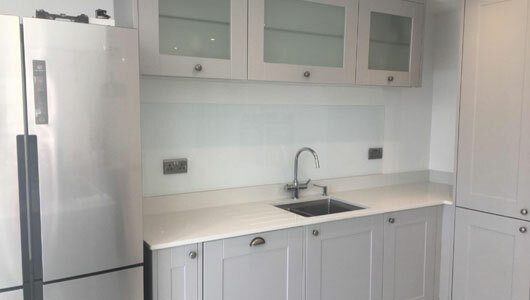 Both Kitchens are really made unique by the splashbacks. Having had mine for quite a few months I can say it is easy to keep clean and still looks like the day it was fitted. 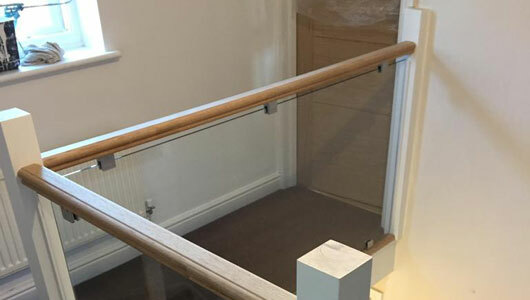 I was very impressed by the measuring and fitting service and especially how they manage to fit the glass perfectly around sockets, etc. and to adjust the design so it flows regardless of the variations in height. 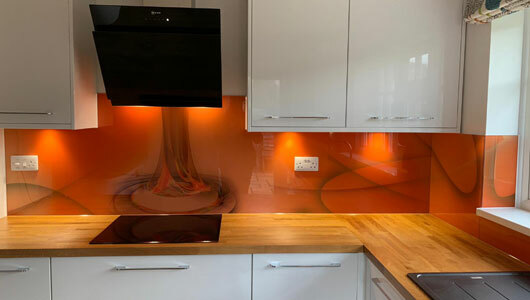 Very happy with new Splashbacks. Service very efficient and professional. Mike did the fit and was very polite and helpful, as were all office staff. 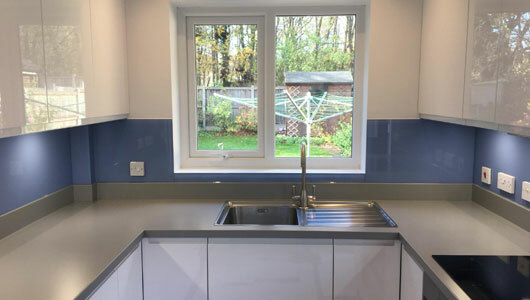 Was apprehensive at using a company I only reviewed on web but really did not need to worry with Splashbacks of Distinction. Chose my own Mylands paint colour which was a very good match. Couldn't be happier and confident to recommend. Very happy with the finished result. Chad and his team were amazing, very helpful, and above all the price was very competitive. 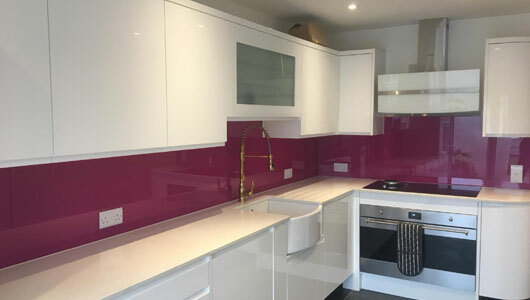 My kitchen looks beautiful as a result of the new splash backs. Thank you. I was originally going to get wallpaper up, with glass covering it to protect it, in the kitchen. 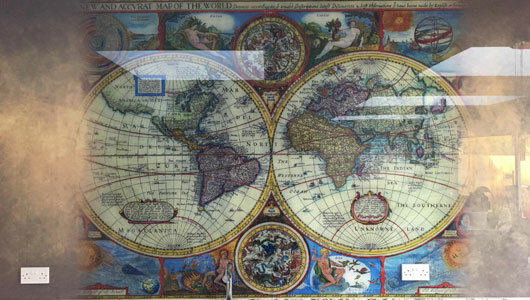 Chad said I could get the vintage map printed on glass. Chad was immeasurably patient and informative throughout the whole process as i dithered and changed my mind on a few occasions. The measuring was quick and the fitting done painlessly. 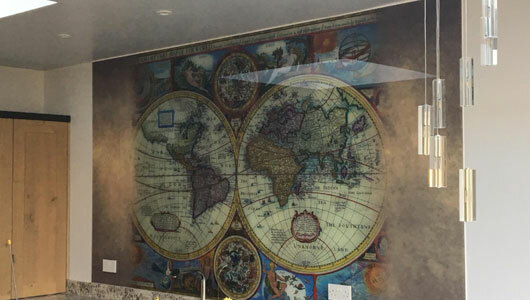 The finished 3m long vintage world map looks absolutely epic. Can't recommend enough, from start to finish. Helpful, informative, patient and quick! 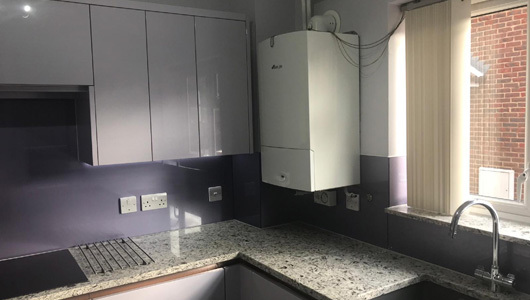 First Class Service - this was a referral and with an excellent customer service, to pricing and to the full professional services on the installation team (Tom). Highly recommend this company happy to be contacted for feedback. Very good. Very polite and personable. We are really pleased with the work and care taken. It looks stunning! Very efficient and professional service. Thank you. Really good installation, very polite, worked very clean. Very happy. Really pleased, thanks very much. Finished the kitchen off perfectly. Fitting excellent, thanks. Fantastic service, excellent communication, prompt efficient service, so so happy, absolutely delighted with the final product. 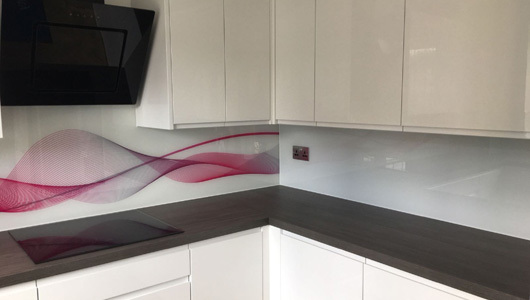 Splashbacks of distinction recently made an installation in our kitchen. Very courteous personnel. 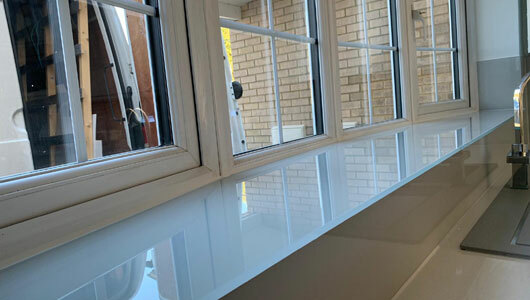 Michael who measured up and installed to a very high standard, was very pleasant, and kept everything tidy and clear during installation. Highly recommended the product and service. 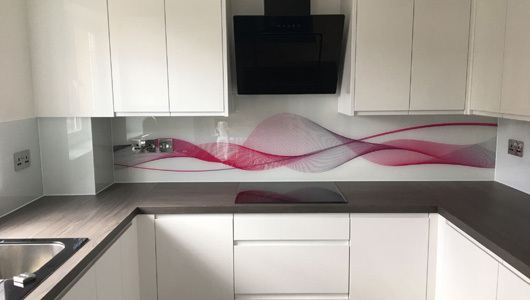 I would definitely recommend Splashbacks of Distinction. The level of customer service was outstanding. 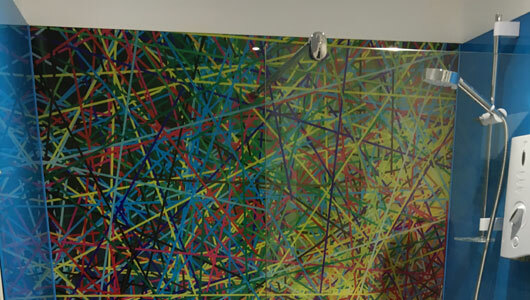 Austin is a huge asset to the company; with Chads help, we were able to decide on the correct design and colours. 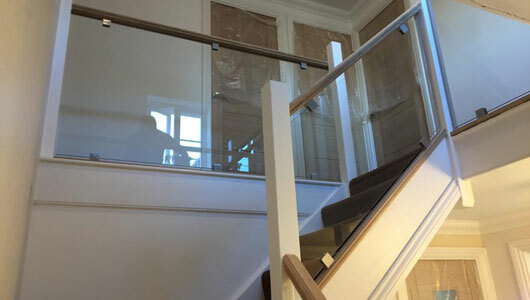 From Sales, through to installation, the whole process was executed with great ease and efficiency. 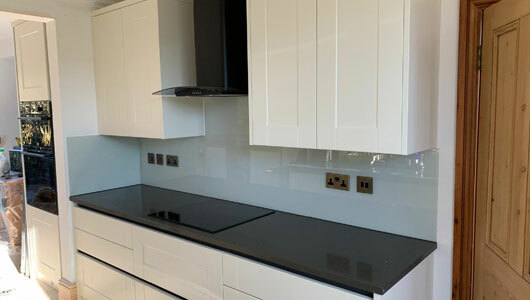 Splashbacks are a great alternative to tiles and our kitchen looks amazing. 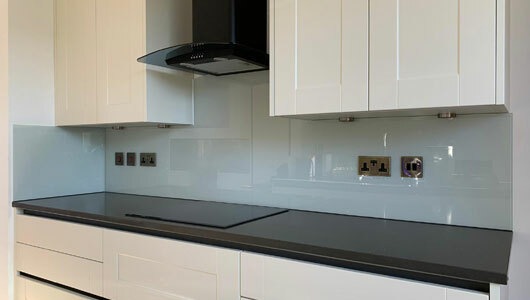 Splashbacks of distinction are exactly that, very competitive, very professional and deliver a 1st class job. I wouldn't hesitate to recommend this company in the future. Chad kept me updated the whole way through and I can say I'm more than happy with the service I received. 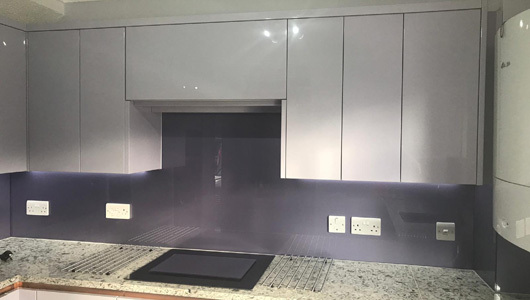 Well done Splashbacks, many thanks. 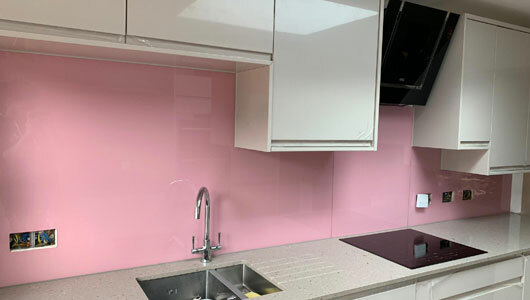 Love, love, love my new splashbacks. Everyone I dealt with in the company were helpful and polite. 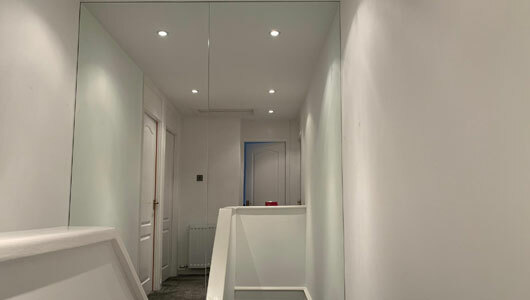 Workmen were professional, friendly, helpful and did a fantastic job. 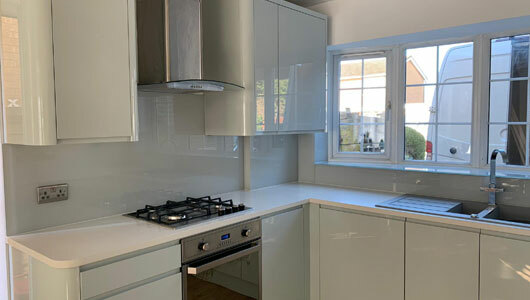 After a new kitchen extension my splashbacks are my favourite part, so easy to clean as well. Highly recommended. 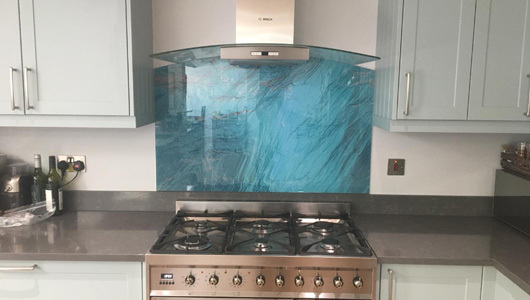 Thank you, Splashbacks of Distinction. Absolutely fantastic service from everyone you liaise with in this company! Nicola in the office was simply lovely. She was so helpful and accommodating anytime I spoke to her. Nothing was too much trouble. Tom was amazing on the templating. On the fitting date both Tom and Michael were professional, so tidy and helpful. They did a fantastic job. The kitchen looks great after all their hard work. 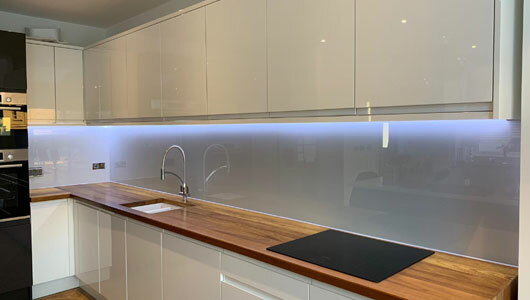 I would not hesitate to recommend Splashbacks of Distinction and I would strongly suggest considering them for such work. 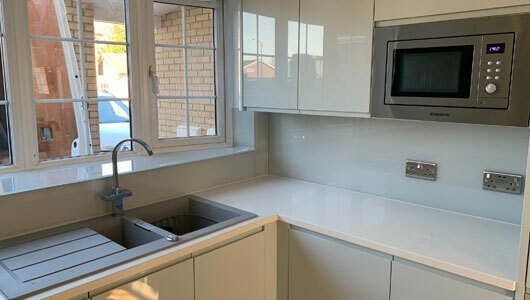 I would like to say a big thank you to Splashbacks of Distinction for their work today - I would definitely recommend. 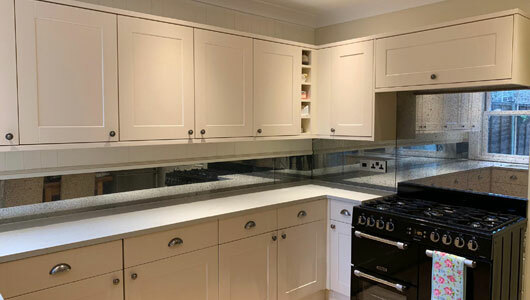 I would personally like to thank Nicola for arranging the very detailed quote, being very professional and thorough during the quotation, selection and payment process, making things very simple and clear. Also, Tom for being very conscientious with his detailed time consuming survey, advice for layout, colour, etc. Finally, Tom once again and Dan for undertaking the installation - doing a very thorough, good job / finish - Was not rushed at all. Tom and Mike were absolutely great from templating right the way through to the fix which they completed today. 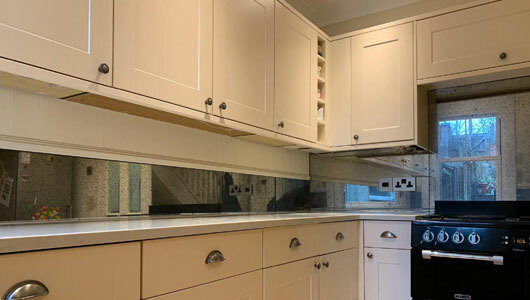 Really professional, tidy and helpful and the kitchen looks great. Both Nicola and Lisa in the office were also really friendly and helpful. 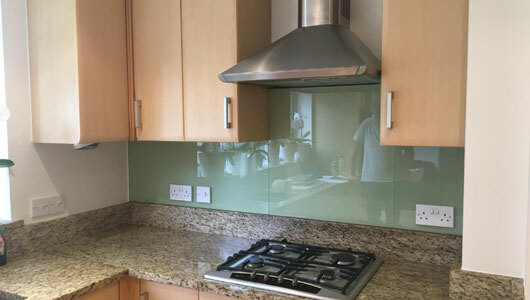 If you are considering splashbacks, I would thoroughly consider giving Splashbacks of Distinction a call. The guys arrived this morning on time and were courteous, clean and thorough in all they did. 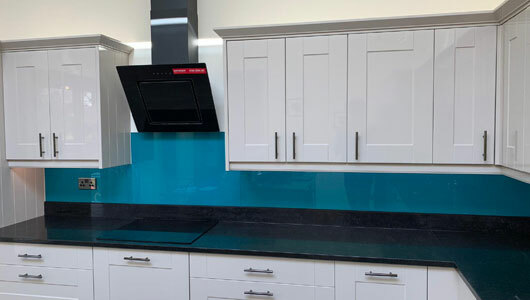 I am over the moon with my new blue splashbacks, they look better than I had imagined especially with a little bit of rainbow sparkle. 100% recommendation! Thank you. 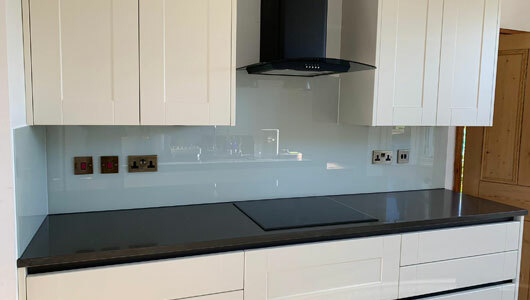 Absolutely delighted with the work undertaken by Splashbacks of Distinction yesterday as they fitted a fabulous glass splashback into our kitchen. I am so impressed we have ordered another piece for the other side. The finish and attention to detail by the very pleasant fitters is great. Also, Nicola in the office is a joy to talk to. I definitely recommend them and have already done so to other members of our family. 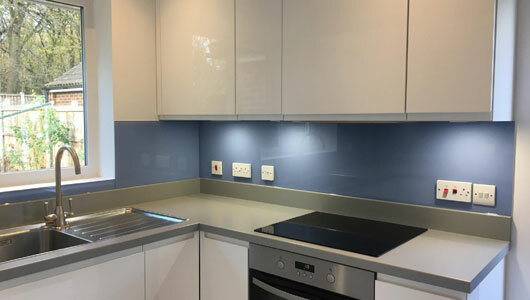 Massive thanks to Tom & Dan for fitting our Kitchen Splashbacks today. Absolutely lovely blokes and they have done a brilliant job. Thanks also to Nicola for sorting all the appointments etc - been most helpful. Would highly recommend this company and they do the job from start to finish which seems to be rare! Measuring, manufacturing and fitting all done by one company! Thanks again - I absolutely love it! Fantastic company. Great service provided by everyone right from day one until installation. 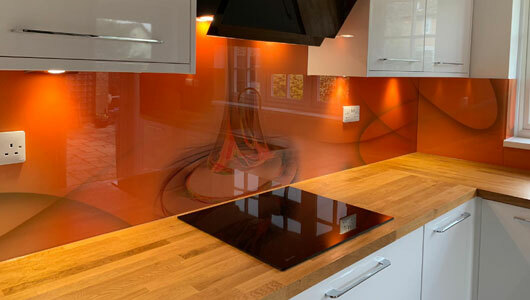 The quality of the splashback and finish is top class. 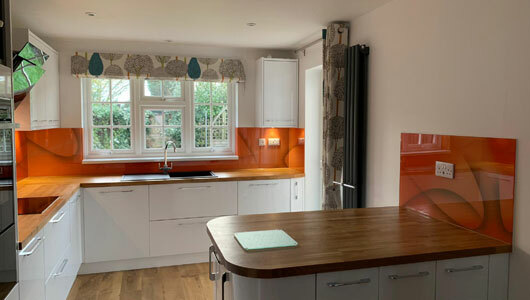 We are absolutely delighted with our new kitchen! We were impressed with the service from start to finish. They came and measured within a few days and I was called before their arrival. 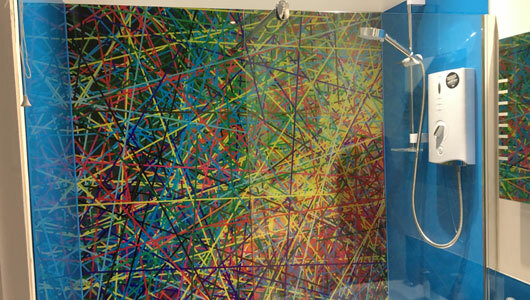 The quote came back later that day and we now have beautiful printed splashbacks fitted of New York! Couldn't be happier. Absolutely first-class customer service with great knowledge and professionalism. 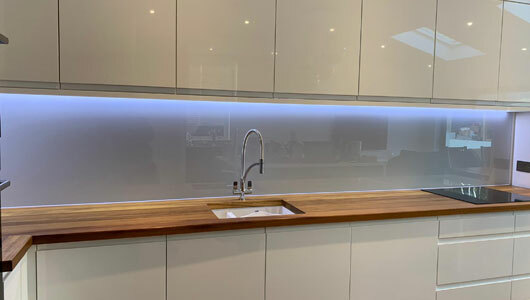 I love my new kitchen splash backs and highly recommend you. Thank you. 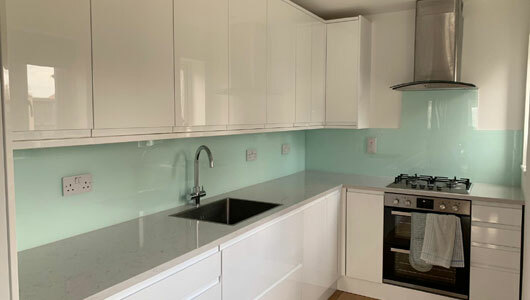 Excellent, friendly service, really pleased with the Luscious Lime splashback in our kitchen and grey in our utility. Would highly recommend! 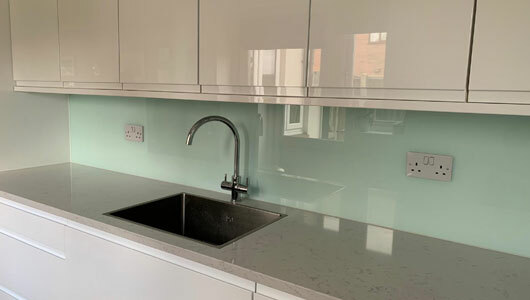 Amazing job, the splash backs look brilliant. The guys were very helpful. I was impressed with their attention to detail and the fact that they cleaned up so well after. I would recommend them to anyone. Ray and Tom came to my house to fit my splashbacks bang on time. Top notch job. 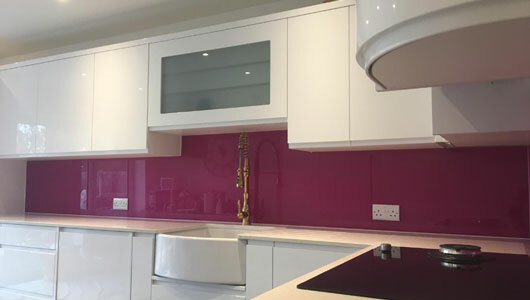 Highly recommend splashbacks of distinction!!! They Gave me a great price. The girlfriend loves it. Great service and communication from the team. Love the finished look. Top service couldn't be more pleased. 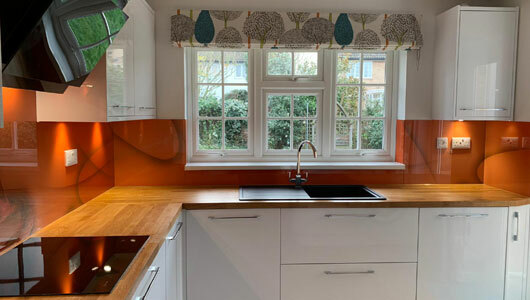 Tom fitted and measured our splashbacks and they are perfect. Would highly recommend. Fantastic friendly and efficient service from beginning to end! Would recommend them 100%. 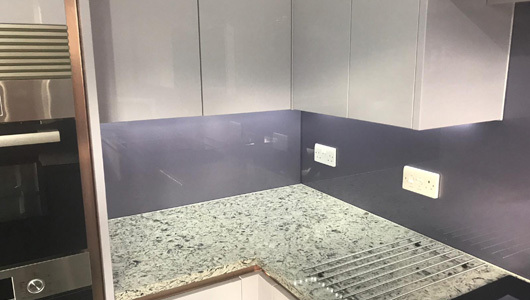 A massive thank you to everyone at Splashbacks of Distinction for their hard work. 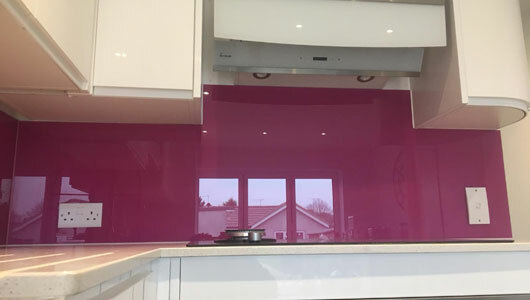 Had my splashbacks fitted today. Looks fab. One very happy customer. Placed the order two weeks ago. 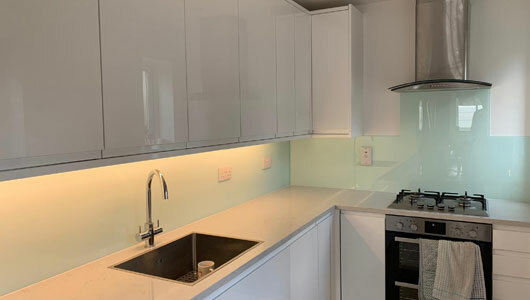 As soon as the measurements were taken the white glass splashback was fitted in a couple of hours. Perfect - The kitchen is complete! Highly recommended. 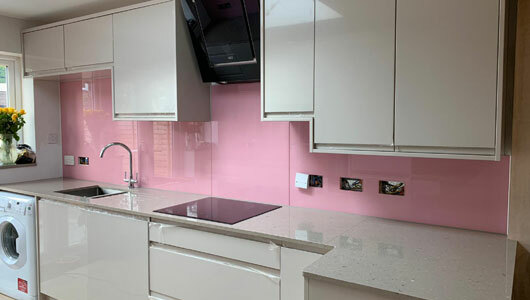 I have recently used Splashbacks of Distinction to provide me with a bespoke splash back for my new kitchen. 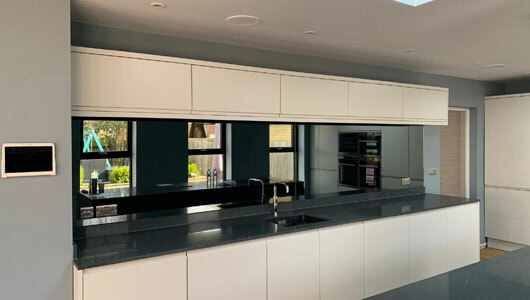 I would highly recommend this Company to anyone and can offer nothing but the highest praise to Nicola and Ray for their customer service and workmanship throughout my dealings with them. 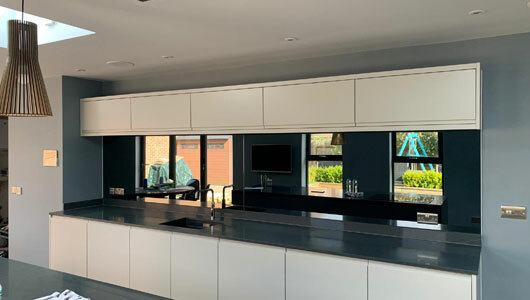 They were without doubt the best value for money compared to the numerous companies that I approached and they were not afraid to take on a potentially tricky design, offering an end to end service unlike many companies on the market. The results are outstanding and I have become the envy of all of my friends. I will definitely be recommending you to my friends and family that might need your services in the future.